Last night’s supper, today’s lunch, and one of my current favourites. I suppose this dish should be called Seasonal Vegetable Soup with Roasted Belly of Pork, but the pork belly is the star of the show no matter how delicious the soup is. 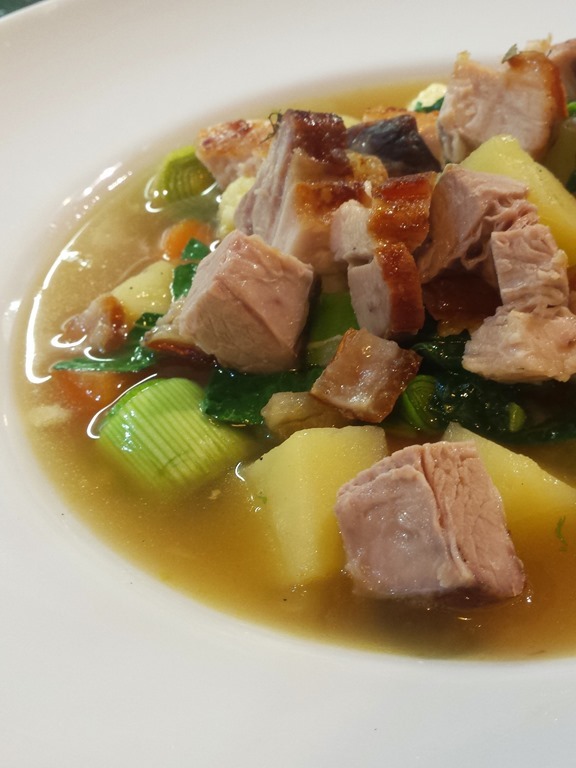 So it’s really all about the roasted pork belly with crispy crackling skin and … whatever soup you find to go with it. I added the pork belly recipe to our recipe collection, it’s right here: http://food.gauweiler.net/index.php/recipes/39-pork-belly. This entry was posted in Food and Drink and tagged cooking by w7. Bookmark the permalink.